N5200PRO is not only a file server, but it also supports iSCSI initiators. 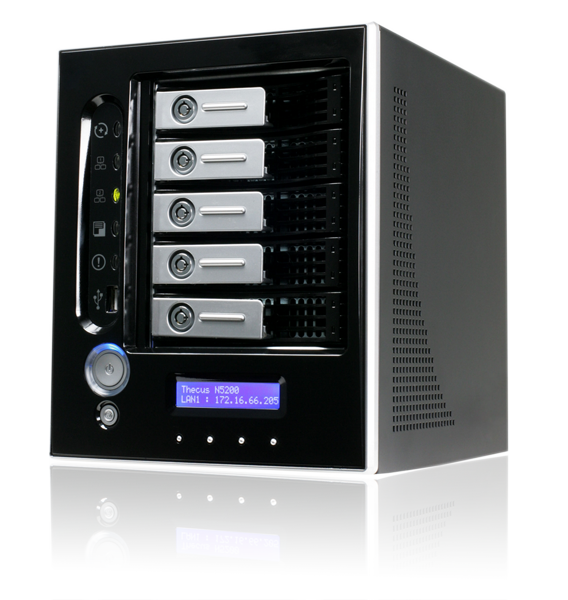 Your server can access N5200PRO as a direct-attached-storage over the LAN or Internet. There is no easier way to expand the capacity of your current application servers. All storage needs can be centrally managed and deployed. This brings ultimate flexibility to users. 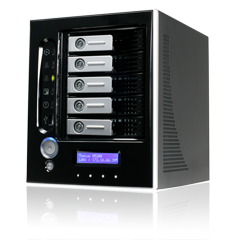 N5200PRO supports multiple RAID volumes on one system. So, you can create RAID 0 for your non-critical data, and create RAID 5 for your mission-critical data. Create the RAID level protection depending on your needs. N5200PRO is equipped with a Low Voltage Intel® 1.5GHz Celeron® M Processor and 512MB DDR system memory, which provides even faster response and more concurrent connections. With its built-in Module compatibility, the N5200PRO is able to run more applications at the same time. N5200PRO supports scheduled power on/off. With this feature, users can set what time the system turns on or off. This feature is a big plus for people who want to conserve energy. Wake-On-LAN enables users to remotely turn the system on without leaving their seat. Because businesses depend on being able to retrieve their data, the N5200B PRO comes with both Load Balancing and Failover to optimize and ensure network traffic. With its Failover capability, the N5200PRO automatically switches to an alternate Ethernet connection should the first one be inaccessible. With these two functions, the N5200B PRO provides users with greater network reliability. The N5200 is also equipped with Nsync, Thecus' remote data backup application. With Nsync, users can have the N5200PRO automatically upload files to an remote storage device at a designated time. What's more, if the remote device is another N5200PRO, the connection is made via a secure connection. Designed for SMBs for enhanced data protection, Nsync takes the guesswork out of data backup. No stranger to innovation, Thecus Technology continues to redefine network storage. Thecus brought NAS storage to the home with the two-bay N2100, and powerful, flexible NAS storage to SMB's with the N5200. Today, Thecus is pleased to introduce its latest NAS device – the N5200PRO. With unparalleled performance and a bevy of useful features, the N5200PRO brings together Thecus' latest and greatest storage technologies for a NAS device unlike any other. Designed for hardware enthusiasts and SMBs, the N5200PRO packs some serious power under the hood. Driving the N5200PRO is a Low Voltage Intel® Celeron® M Processor and 512MB of DDR memory, making the N5200PRO the fastest 5-bay NAS on the market. With five 3.5" SATA drive bays, the N5200PRO features up to 5TB of storage capacity, and support for multiple RAID levels allows multiple RAID volumes on a single system for optimal flexibility. To access data faster than ever before, the N5200PRO supports iSCSI initiators, enabling users to access the N5200PRO as an iSCSI target device over the Internet or LAN. With these features, users will experience high system performance, flexibility, and data reliability. But that's not all. The N5200PRO offers superior power management features with scheduled power on/off and Wake-on-LAN. Users are able to have the system turn on and off to conserve energy and lower overall cost of ownership. To back up data, the N5200 comes complete with Thecus' suite of backup utilities, including the Thecus Backup Utility and Nsync, Thecus' remote backup solution. And because the network has to be reliable, Thecus offers two options for users. With the built-in LCD screen, the N5200PRO is a breeze to setup and administer, and an eSATA port allows for easy storage expansion. Users that need load balancing and failover can choose the N5200B PRO, while users that prefer a built-in 4-port Gigabit switch can opt for the N5200BR PRO. No matter which is chosen users can look forward to Thecus' signature performance, reliability, and ease-of-use. "We've taken the very best Thecus technologies and included them into the N5200PRO," says Thecus General Manager Florence Shih. "With a long list of new features and improvements, we're confident that the N5200PRO will impress hardware enthusiasts and SMBs the world over." *PDC/AD support: Works as a client member in an Microsoft NT 4.0 domain/Active Directory domain, allowing the N5200 to utilize the domain users and groups setting for authentication to the system and authorization to the share folders. Supports multiple RAID modes – Users can create multiple RAIDs on one system.